"There are many things happening around us, a good number coming from the ground. Holes in the earth's crust have developed from Siberia to Indiana to Louisiana. There are rumblings of volcanic activity from Iceland to Yellowstone. 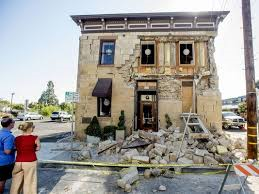 The strongest earthquake in Napa Valley in more than a quarter of a century struck over the weekend, followed by significant if not destructive trembles in Chile and Peru. This is of particular note because historically major quakes have come one after another despite distances between them of thousands of miles. We really don't understand the earth. Shortly after the great 1906 earthquake in San Francisco there was a huge tremor in the Aleutian Islands, and just thirty minutes after that was a yet greater one in Chile. There were major quakes that year in New Guinea, Australia, the Antilles, China, and again in Chile. Some of the sinkholes and quakes (see: Oklahoma) are caused by drilling. But it is way beyond what humans do. We do not create volcanic activity. Some of it seems to reflect on an alleged prophecy from the famous apparitions of the Blessed Mother at LaSalette, France, where it was asserted (in a part of the messages that did not meet with official Church approbation) that "nature begs vengeance on account of men, and she shudders with dread, awaiting what must happen to the crime-stained earth. Tremble, earth, and you who profess to serve Jesus Christ, while interiorly you adore yourselves, tremble; for God will hand you over to His enemy, because the holy places are in a state of corruption; many convents are no longer houses of God, but pastures for Asmodeus and his own... The seasons will be changed, the earth will produce only bad fruits, the heavenly bodies will lose the regularity of their movements, the moon will reflect only a feeble reddish light; water and fire will lend convulsive motions to the earth's sphere, causing mountains , cities, etc., to be swallowed up." This all is interesting in light of recent claims that in January of 1944 Sister Lucia dos Santos, seer from Fatima, while in front of the tabernacle in the convent's chapel (imploring God for enlightenment as to His Will, as far as writing down the "third secret"), "felt my spirit flooded by a light-filled mystery which is God and in Him I saw and heard: the point of the flame-like lance which detaches, touches the axis of the earth and it [the earth] shakes: mountains, cities, towns and villages with their inhabitants are buried. The sea, rivers and clouds leave their bounds, they overflow, flood and drag with them into a whirlpool, houses and people in a number unable to be counted; it is the purification of the world from the sin it is immersed in. Hatred, ambition, cause destructive wars. Afterward I felt in the increased beating of my heart and in my spirit a quiet voice which said: ‘in time, one faith, one baptism, one Church, Holy, Catholic, Apostolic. Heaven in eternity!’" This allegedly comes from an unpublished diary alluded to by her fellow sisters in an official publication of the Carmel of Coimbra. If authentic (it was reported by a well-known Vatican journalist, Antonio Socci), it hearkens back to LaSalette and forward to apparitions -- likewise approved -- at Kibeho, Rwanda, where one of the sanctioned visionaries, Anathalie Mukamazimpaka, told us she had a vision of an event in which "I saw mountains crashing into each other, stones coming out of the earth, nearly as if they were angry. 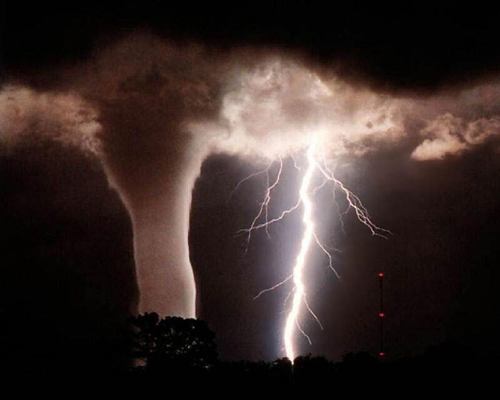 I saw storms crashing against each other and fire coming from them. I don't know what this means. I was told that people are causing this and that it is coming." It is very interesting in this time of "rumblings" (which we will be addressing in a special way next month, at retreats in California, and then New Orleans). No one is saying it's a "rapture" or the "end of the world." We are speaking of purification -- as told to seers who have the approval of the formal Church. While we long had assumed that the image in the third secret -- of an angel ready to torch the world -- had to do with potential nuclear conflict (for it involved fire, and Fatima focused on the threat of Russia), or a comet, the diary entry, if valid, gives us pause and causes us to think in geologic terms. The earth: is it beginning to convulse? 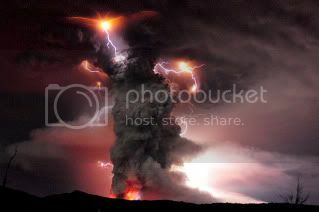 And when it comes to pareidolia, did you ever note, in those volcanic clouds, the angry "faces"? Rumblings. Fish die-offs. Climate swerves. One day, we will realize a deeper component to nature." "Abu Bakr al-Baghdadi, the self-proclaimed leader of the 'Islamic State' stretching across Iraq and Syria, has vowed to lead the conquest of Rome as he called on Muslims to immigrate to his new land to fight under its banner around the globe. 'Those who can immigrate to the Islamic State should immigrate, as immigration to the house of Islam is a duty,' he said in an audio recording released on a website used by the group formerly known as the Islamic State of Iraq and al-Sham. Hassan Hassan, an analyst at Abu Dhabi's Delma Institute, wrote that Baghdadi provided the most radical challenge since the emergence of Osama bin Laden and al-Qaeda. 'The whispers of support to a caliph in Afghanistan are now replaced by clear words and acts, amplified by social media,' he said. 'Jihadism has evolved significantly. It is no longer limited to narrow “elitists” who travel to distant countries to wage jihad. Today’s jihad is more sophisticated and individualised and can be waged everywhere.'" See here. 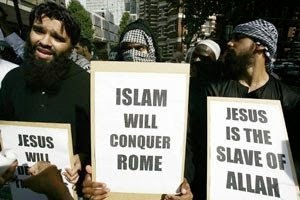 Although militant Islamists across the globe have a stated goal of conquering Rome and driving Jews in Israel into the sea, have no fear folks. Bishop Robert McManus assures us that, "..the Catholic Church has engaged herself in inter-religious dialogue with Muslims. This dialogue has produced a harvest of mutual respect, understanding and cooperation throughout the world." See here. Curiously, the same Bishop McManus who says he believes in dialogue, mutual respect, understanding and cooperation, refuses to answer letters from Catholics faithful to the Magisterium when they witness doctrinal dissent, various liturgical abuses, radical feminist ideology or New Age occultism. Apparently Bishop McManus believes in a sort of peekaboo dialogue - now you see it, now you don't. For when I wrote to His Excellency expressing my interest in pursuing a vocation to the ministerial priesthood, I received no response whatsoever. So be of good cheer folks. Even though militant Islam is committing genocide while destroying entire Christian communities, everything is really okay. Bishop McManus assures us that we are reaping a harvest of respect. May a Catholic question the Pope or engage in constructive criticism of Bishops who appear to depart from Tradition? Can I be a good Catholic and still be skeptical or even critical of certain things said or done by bishops and popes that appear to contradict all the Tradition of the Church? This is a question that I am asked many times. It is, of course, the result of disquiet over what is said by Church authorities mainly in Rome but elsewhere as well. So many “off-the-cuff” pronouncements by members of the hierarchy and the reappearance of theologies that we thought were dead because they lead to dead ends have had this disquieting effect on many of the faithful. I fear that I will not be able to answer your question in a way in which you will be satisfied. For a clear answer would have to be part of a serious theological task that so far no one has undertaken and that involves a serious rethinking of the role of the Pope and of the bishops in the Church in the light of Tradition. Tradition, we must always remember, is something living and therefore is integrally connected with the past and open to the future, all under the guidance of the Holy Spirit. It bothers me that those Catholics who are labeled as Traditionalists are seen to be somehow locked in the past. While it is absolutely true that the teaching of the Church in the past is necessary for true development of the Church’s teaching in the present and future, one must always be one’s guard against antiquarianism (which in part gave us the Novus Ordo ) and against nostalgia for a perfect time that never really was. One of the greatest problems in the Church for the past hundred years has been a creeping Ultramontanism that seeks to almost identify the Church with the Pope. We see this happening all through the 20th century, but especially during the last quarter of that century. The era of instant communication afforded by the Internet and the all-pervasive presence of the media has contributed greatly to this situation. 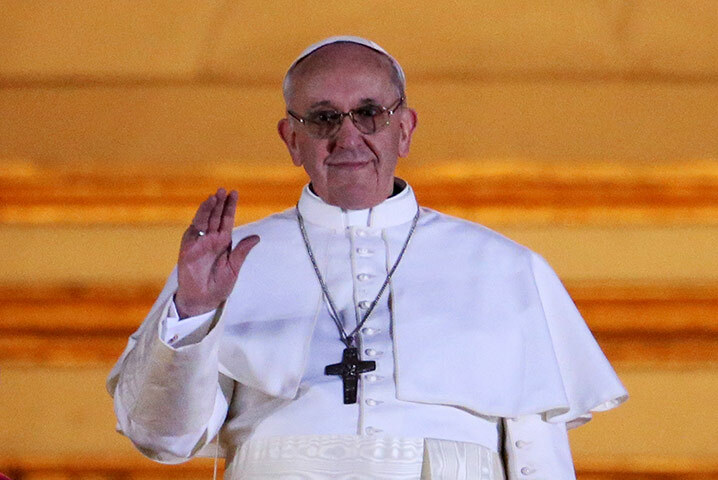 But it is also because of a series of Popes who traveled widely in the world in the name of evangelization. Those Masses in football stadiums with thousands and thousands of people, the World Youth Day celebrations, all followed by the media everywhere as they would follow “rock stars”, further contributed to this phenomenon. The irony of all of this is that we find ourselves in the grip of reactionary forces that are pushing liberal (as Blessed John Henry Newman understood that word) causes in the Church. That Newman foresaw this in his Biglietto Speech over one hundred years ago is no comfort to us who are going through this time of tribulation. Having said all of this, I will answer your question in a qualified way. My answer is as follows. 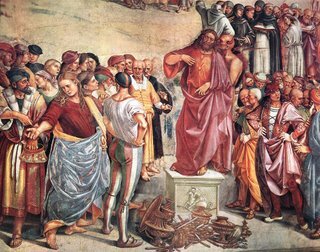 Yes, you are free as a Catholic to question the decisions of the bishops of the Church, including the Bishop of Rome, when they seem to you to depart from the Tradition, the teaching of the Church for the past two thousand years, in its roots in Scripture and in the organic growth of the Tradition. But one must differentiate here between criticizing and questioning. It really does no good to criticize specific words or acts of the Bishop of Rome or of any bishop in an uncharitable and carping way. It is often an offense against charity and leads to hardness of heart. But it is surely the duty of the laity to question pronouncements (including press conferences and sermons) and decisions of the hierarchy when they seem to depart from the teaching of the Church, from the Tradition. Newman believed so strongly in the importance of an educated laity, educated both in the secular sense and in the ecclesial sense! And in this way it is the duty of the educated and faithful laity to question decisions of the hierarchy on the basis of the Tradition of the Church. And questioning here means to ask the bishops (with no animosity) how a specific pronouncement, whether official or unofficial, of a bishop squares with the Tradition. In this way, for instance, it is perfectly fine to ask how the image of the Church as a “field hospital” is consonant with the self-understanding of the Church within her Tradition. I am sure, dear Confused in Ontario, that my response is not crystal clear nor does it help to assuage your genuine concerns about the state of the Church. But a priest is neither a medicine man nor a magician. He is called to faith in the same way as every Catholic is called to faith. And he sees, like we all do, “through a glass darkly”. But even through that partially de-silvered mirror that is the Catholic Church here on earth, we see the glory of the Truth in the face of the One who is our only hope, our only source of truth, our only source of real life, our Lord and Savior, Jesus Christ." Many today, including sadly many Catholics, equate criticism with condemnation. Dr. Montague Brown explains the difference between the two nicely: “Criticism is the honest appraisal of the value of ideas or actions…Pursued in the right spirit, it is a positive undertaking whose purpose is to gain an accurate understanding for the sake of growing in wisdom and virtue….Condemnation goes beyond evaluation of an idea or action to a declaration of the worthlessness of a human being. It is never fair and is a wholly negative judgment, referring only to weaknesses. Because condemnation is unreasonable, it serves no purpose in our quest for wisdom and virtue.” (The One-Minute Philosopher, pp. 28,29). The New Church gains strength as the Man of Sin approaches. As a result of unrepented sin, America is gradually disintegrating and the Police State is beginning to emerge. See here and here for example. Our Lady warned, "I foretold to you the great chastisement which would strike this poor humanity which has become pagan and built a new civilization without God, and which is threatened by violence, by hatred, by war, and which is running the risk of destroying itself by its own hands....I also foretold to you the great crisis which would take place in the Church, because of the great apostasy which has entered into her, caused by an ever wider diffusion of errors, by her interior division, by opposition to the Pope and by the rejection of his Magisterium. This most beloved Daughter of mine must live the hours of her agony and of her sorrowful passion. She will be abandoned by many of her children. The impetuous wind of persecution will blow against her, and much blood will be shed, even by my beloved sons...Tell everyone to enter the ark of my Immaculate Heart, in order to be protected and saved by me....Because of the generous response which I am receiving everywhere from my littlest children, I promise to intervene to save you in the hour of the great trial.." (Our Lady to Father Gobbi, Spiritual Exercises in the Form of a Cenacle with the Bishops and Priests of the M.M.P. from the United States and Canada, October 13, 1994). Bishop McManus, wouldn't this be an opportune time to apologize to Mr. Robert Spencer and extend him a warm invitation to speak at next year's Catholic Men's Conference? "The Pontifical Council for Interreligious Dialogue deplores in no uncertain terms the acts of violence by the militants of the Islamic caliphate in the Middle East, especially in Iraq and Syria. The Vatican body calls on the members of all religions and on the international community to join in the condemnation. It also calls on Islamic religious leaders to condemn the use of religion as a false justification for terrorism and to make the culture of coexistence and dialogue that has developed in the past few years more real and credible." The full translation of the statement issued by the Pontifical Council is presented below. "The whole world has witnessed with incredulity what is now called the "Restoration of the Caliphate," which had been abolished on October 29, 1923 by Kamal Ataturk, founder of modern Turkey. Opposition to this "restoration" by the majority of religious institutions and Muslim politicians has not prevented the "Islamic State" jihadists from committing and continuing to commit unspeakable criminal acts. -indiscriminate violence aimed at terrorizing people to force them to surrender or flee. Religious leaders are also called to exercise their influence with the authorities to end these crimes, to punish those who commit them and to re-establish the rule of law throughout the land, ensuring the return home of those who have been displaced. While recalling the need for an ethical management of human societies, these same religious leaders must not fail to stress that the support, funding and arming of terrorism is morally reprehensible. That said, the Pontifical Council for Interreligious Dialogue is grateful to all those who have already raised their voices to denounce terrorism, especially that which uses religion to justify it." "In a statement which was published in The Catholic Free Press...Bishop Robert McManus explained his decision to rescind the invitation to Mr. Robert Spencer to speak at the Diocese of Worcester's Catholic Men's Conference which is to be held next month. Bishop McManus writes, 'In light of my recent decision to rescind the invitation to Mr. Robert Spencer to speak at the Catholic Men's Conference next month on the topic of Islam in its relation to Christianity, I should like to reflect briefly on the conciliar document entitled, The Dogmatic Constitution on the Church (Lumen Gentium), specifically on paragraph 16 of Chapter 2 which speaks about the special relationship that Christianity has to Islam. The paragraph states, "But the plan of salvation also includes those who acknowledge the Creator. In the first place among these are the Muslims who, professing to hold the faith of Abraham, along with us adore the one and merciful God, who on the last day will judge mankind." As a result of such a theologically salient statement, the Catholic Church has engaged herself in inter-religious dialogue with Muslims. This dialogue has produced a harvest of mutual respect, understanding and cooperation throughout the world and here in the Commonwealth of Massachusetts. My decision to ask Mr. Spencer not to speak at the Men's Conference resulted from a concern voiced by members of the Islamic community in Massachusetts, a concern I came to share. That concern was that Mr. Spencer's talk about extreme, militant Islamists and the atrocities that they have perpetrated globally might undercut the positive achievements that we Catholics have attained in our inner-religious dialogue with devout Muslims and possibly generate suspicion and even fear of people who practice piously the religion of Islam...I based my decision solely on the concern that Mr. Spencer's talk would impact negatively on the Church's increasingly constructive dialogue with Muslims.' (Bishop shares concerns about conference speaker, Catholic Free Press, February 8, 2013 edition). While it's certainly true that Vatican II insists, 'The Church regards with esteem also the Moslems' and that Christians and Moslems should 'forget the past and..work sincerely for mutual understanding..' (Nostra Aetate, No. 3), dialogue, if it is to be authentic, always means taking the other seriously and approaching him with reverence and love. And this can only be accomplished by communicating with the other in truth. In his book entitled Truth and Tolerance: Christian Belief and World Religions, Pope Benedict XVI makes a few observations which Bishop McManus would apparently find problematic. The Holy Father writes, 'To what extent the new surge forward of the Islamic world is fuelled by truly religious forces is..open to question. In many places, as we can see, there is the danger of a pathological development of the autonomy of feeling.."' (p. 104). Wasn't this to be the point of Mr. Spencer's talk? Would Bishop McManus accuse the Holy Father of undercutting the positive achievements which Catholics have attained with regard to inter-religious dialogue with Moslems? Why is it acceptable for Pope Benedict XVI to speak of the danger of Islam 'letting violence have a place' but unacceptable for Mr. Spencer to talk about 'extreme, militant Islamists and the atrocities that they have perpetrated globally'? Bishop McManus insists that Mr. Spencer's presentation would not be 'suitable' for the Men's Conference because its focus 'would be on the danger of militant Islamist jihad.' But jihad is not just an aspect of 'militant Islam.' Jihad is the duty to engage in holy war against unbelievers or enemies of Islam if called upon to do so. It is one of the basic tenets and requirements of Muslim faith. Which is why Pope Benedict XVI has warned that Islam 'is always in danger of losing balance' and succumbing to violence." to condemn "the use of religion as a false justification for terrorism and to make the culture of coexistence and dialogue that has developed in the past few years more real and credible," perhaps now would be a good time for Bishop Robert McManus to apologize to Mr. Robert Spencer and to invite him to next year's Catholic Men's Conference? This is Pope Francis' idea of a priest in good standing? The Social Gospel is not the true Gospel of Christ. It is a counterfeit which has been constructed to pave the way for the Man of Sin. "Fidel Castro is often portrayed as the "benevolent" dictator of Cuba, such portrayals are unarguably wrong. The evidence of his bloodthirsty and murderous nature is unequivocal and available for anyone who wants to know the truth. Unfortunately such evidence is rarely discussed by the news media and at schools. There's perhaps no more grizzly atrocity committed by Fidel Castro than the firing squads which he implemented. Beginning as a rebel, before he would eventually take power in Cuba, Fidel Castro used firing squad executions to enforce discipline, punish followers deemed disloyal or intimidate potential opposition. At the beginning of the Castro regime there was a reign of terror typical of revolutions in which the firing squad was used prominently but the executions continued for decades. The Cuba Archive which documents deaths and disappearances resulting from Fidel Castro's Cuban revolution has documented 3,615 firing squad executions conducted by the Cuban state since Castro took over on January 1, 1959. Opponents of the death penalty should be horrified at the amount of death Fidel Castro and his accomplices have directly caused. It's important to note that in Revolutionary Cuba there are none of the due process guarantees found in a western-style democracy. Most of Castro's firing squad victims were afforded only a perfunctory show trial the outcome of which was predetermined, some didn't even get that. Ernesto "Ché" Guevara is a popular culture icon, his face adorns posters and t-shirts around the globe. Most people don't realize that he was Fidel Castro's chief enforcer and had a personal hand in at least 100 firing squad executions, often delivering the coup de grace personally. In response to questions about Castro's firing squads Guevara once said, "To send men to the firing squad, judicial proof is unnecessary. These procedures are an archaic bourgeois detail. This is a revolution. And a revolutionary must become a cold killing machine motivated by pure hate." In a post which may be found here, Gregory Dipippo notes how, "The fourth Sunday of Lent, John XXIII was once again among the crowd, at Ostia. (about 15 miles to the south-west of Rome.) Thousands of people were waiting for him along the street, in the piazza, in the church. They wanted to see him, to applaud him. They did not know that afterwards, he would rebuke them, in a good-natured way, in his simple , spontaneous, familiar way of speaking. Readers of this Blog know that when I advised the North Quabbin Catholic Community that applause during the Liturgy is not appropriate, I was banned from the Church's Facebook page and ostracized. See here. To this day, the North Quabbin Catholic Community cannot admit that applause doesn't belong in the temple of God and I remain banned for defending sound liturgical rubrics and authentic Catholic teaching. Our Lady has spoken to Father Gobbi many times about the satanic pride which is crippling humanity and so dangerously threatmening it. On December 8, 1993, she told Father Gobbi, "Satan has deceived this entire poor humanity, bringing it so far away from God and building for it idols of his own perversion: money, pride, egoism, amusement and impurity. And so humanity is today greatly threatened by violence, hatred, rebellion and war. During these years, you will see the great chastisement, with which the justice of God will purify this world, which has become a thousand times worse than at the time of the flood and so very possessed by evil spirits.....Satan has also entered into the interior of the Church and has succeeded in darkening her splendor. With the darkness of sin, he has obscured the splendor of her holiness; with the wound of division, he has made an attack upon the strength of her unity; with the spread of errors, he has stricken her in her proclamation of the truth.."